Twitter Usage - US & UK. We live in a world obsessed with connectivity and socialising, whether that be at live events, at a bar or through social media, namely, on twitter. I've been looking into the twitter demographic in the UK and US and it seems that there are some trends to consider when tweeting on behalf of our UK businesses amidst a diverse online community that sends out - are you sitting down? - over 500 million tweets a day! US users like to express opinion and be bold, therefore businesses are more prone to appeals to emotion and personal incredulity to connect with their users and drive debate. UK users like to speak positively about experiences, engage and connect with others and post links that they feel are relevant to their followers. Businesses should aim to continue this trend of positivity in their brand, and with their partners and followers. Acknowledging user opinion (particularly where positive) is a great way to increase user activity and brand awareness. According to research, US users are more emotive in their tweets, and tend to express more outward anger and personal opinion. Brits prefer to speak about joy and excitement to bring others into the conversation. So it's good to be positive about your brand. It’s very hard to comment on someone’s tweet about an argument with their spouse, not so hard to engage in a conversation about drinking beer. UK twitter users are 21% more likely to engage in conversations on Twitter. In the US however, tweets are more likely to be opinion-based original content or a retweet of a celebrity. Prime time for tweeting is different between the nations too. In the UK, we are more likely to delve into the twitter universe during tea breaks or lunch time, merging work and free-time together, whereas US users tend to tweet most in the evening, during their leisure time. 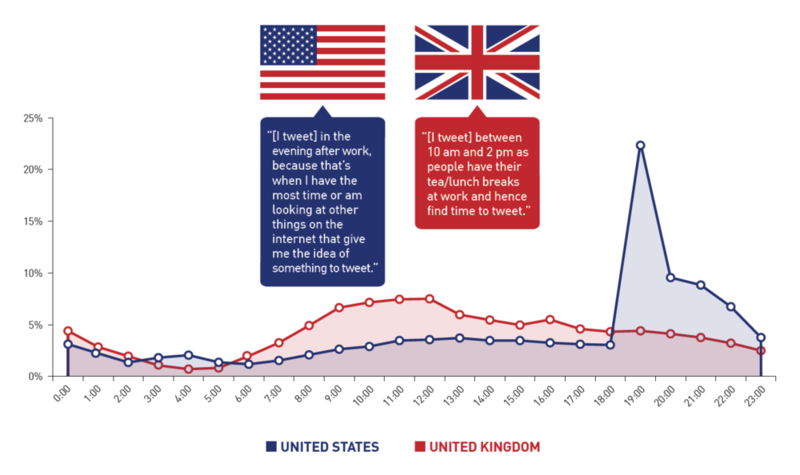 Perhaps this explains the tweet content, with UK users tweeting about things they've discovered during their working day and US users tweeting their opinions about that lady’s dress on American Idol or the frustration at burning the *insert stereotypical American food here. Finally; engagement in brands. US users like to share their opinions of the brand, whereas UK users are more likely to tweet a review of a brand - how reliable it is, how snazzy it looks (yes, I used the word snazzy) and how well it serves its purpose. Over 50% of US brand tweets consist of entertainment references whereas in the UK, we tend to talk about a wide range of brand related topics from services and retail to food and technology. So again, that's worth thinking about when targeting your audience. It is worth bearing in mind that the study I refer to, may not be accurately representative of the entire twitter community, as it is based upon just 400 tweets from the US and the UK. However, the findings are all trends that are quite visible online if you take the time to explore and I found it fascinating when thinking about FW's social output - I thought you might do too! What is even more interesting, is to know how many users there are on ALL of our most popular social media tools and apps. How many people are we ACTUALLY reaching out to across various platforms? This link takes you to a list of stats for over 600 of these tools and is really quite useful.